When cicadas emerge, these snakes congregate in large groups for a big meal. Under cover of darkness, dozens of venomous snakes congregate in a stand of oaks located in a large, tidy yard. Snakes lurk amid the leaf litter, drape themselves from understory shrubs and coil at the base of larger trees. They are waiting, waiting for their prey to arrive. This is not a scene out of some B movie but rather a regular occurrence on warm summer nights in some areas. The snakes are copperheads (Agkistrodon contortrix), and they’ve come to eat cicadas. Like other pit vipers, copperheads are equipped with retractable hypodermic fangs that deliver hemotoxic venom, so their arsenal is well suited to subduing most prey. Why would such a well-armed predator bother to dine on cicadas? For the same reason we eat fast food: It’s cheap and easy. Cicadas can occur in high densities, and they offer no defense of their fat-and-protein-filled bodies other than a crunchy exoskeleton. These snakes are selective about their prey, ambushing newly emerged cicadas before their exoskeletons have had time to harden. Copperheads are also known to consume caterpillars and large moths, both easy and nutritious prey choices. There is no evidence that communal feeding behavior in copperheads is deliberate; rather, it is probably a consequence of snakes in a given area being attracted to particular sites with large densities of emerging cicadas and suitable habitat for ambushing them (large trees with relatively open understory). Congregations of cicada-feeding copperheads are an annual occurrence at some sites, and snakes may follow a regular pattern night after night. Insectivory is just one cool trick that copperheads use to get a meal. Another is a behavior known as caudal luring. Juvenile copperheads (and adults in some populations) have a bright greenish-yellow tail tip. Copperheads will coil their body with the tail elevated and wave it slowly about. The waving tail tip resembles a caterpillar and may entice frogs, lizards and birds to approach close enough for the snake to strike. This behavior also occurs in the closely related cottonmouth (Agkistrodon piscivorus) and in several species of neotropical pit vipers. Texas is home to three subspecies of copperhead: The southern copperhead (A. c. contortrix), broad-banded copperhead (A. c. laticinctus) and the Trans-Pecos copperhead (A. c. pictigaster). These occur in the eastern third, central third and Trans-Pecos regions of the state, respectively. Copperheads are typically found in woodland habitat throughout much of their range, but Trans-Pecos copperheads seem right at home amid the cactus, rocks and Spanish daggers of the Big Bend region. 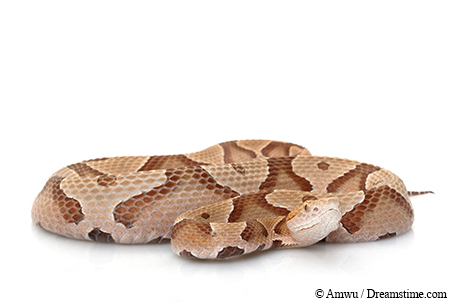 Copperheads may be the most abundant venomous snakes in many areas, but their cryptic coloration and tendency to lie still allow them to avoid detection in most cases. Although not aggressive, they will strike defensively. Most copperhead bites are likely the result of accidental encounters; many victims report not seeing the snake until the strike. Fortunately, copperhead venom is not particularly toxic compared to that of other native venomous snakes, and copperheads are relatively small, with correspondingly short fangs. As a result, fatalities from copperhead bites are rare. Copperhead venom is the subject of intense study as a source of cancer treatment drugs. A component of copperhead venom, called contortrostatin, has been shown to inhibit the growth of several types of cancer cells, and is being explored as a potentially powerful treatment for human breast cancer. Scientific Name: Agkistrodon contortrix ssp. Did You Know? Copperheads have a set of five to seven replacement fangs in their gums as backup in case their fangs break or become stuck in their prey.